Click on a tab below to expand the tab and view information about the service. 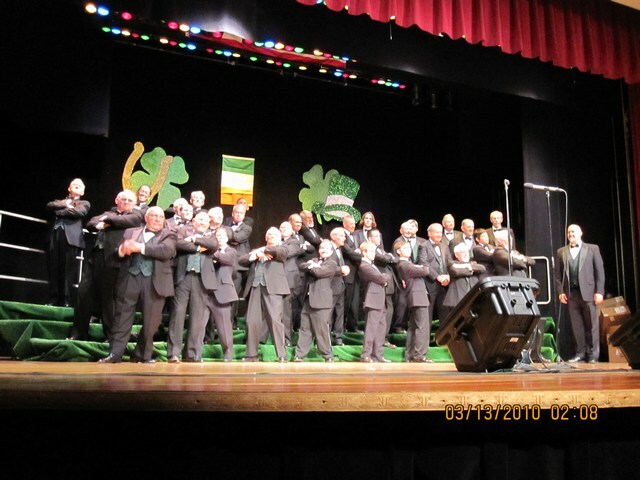 The Sunshine District Coaches Guild is comprised of men that currently coach or that have a great deal of Barbershop Harmony experience that can communicate their knowledge within a coaching situation. The Guild aims to earn the respect of our district choruses and quartets, therefore, it’s necessary that each coach embody the spirit and knowledge of Barbershop Harmony. Our mission is to offer excellent coaching at a reasonable cost and to provide the organizational network to help our District groups connect with these coaches. The coaches are limited to those that the Sunshine District Director of Music and Performance invites. The process of consideration for coaches into the Guild is somewhat stringent. Members must meet a minimal level of qualification and coaching experience. How does it work? Since January 1, 2009, the District offers Guild services to up to 20 groups per year. Chapters and quartets may submit an official Coaching request form (available below) to the District Director of Music and Performance. He will review the request and consider the groups current performance level and match their skill set and requested area of expertise (music, singing, and presentation) to an available coach. The District will offer a $100 honorarium to the coach and the Chapter/quartet will be expected to pay round-trip mileage at $.30/mile. The coaching session will be offered in 2-hour increments after which time the coach may choose to extend the session at his discretion. Please inquire should your group prefer to use someone specific. We will do our best to accommodate every request. What is it? The Society’s program to raise performance levels of our Choruses and Quartets. The intent is to point out the good and not-so-good coupled with suggestions for future show improvement. How does it work? Choruses or quartets request an evaluation of their public performance and provide tickets to the Review Team. What does the critique include? Every phase of the performance: parking and venue, handicapped access, ticketing and front-lobby staff, printed program, lighting, sound, costuming, staging and props, entrance and exits by performers, song selection, flow of program, MC presentation, choreography, vocal production, stage presence, scripting, audience reaction, musicality, guest performers. Experienced Barbershopers with solid music credentials and backgrounds in show production and management. In recent years, at least two Reviewers have attended each SOP event to give broader views of what’s seen and heard. Sunshine Reviewers represent a wide range of talent, including Gold, Silver and Bronze International Medalists, Society Judges, Professional entertainers, Chorus Directors, tenured BBS singers and Chapter Administrators. Who requests a SOP Review? Any quartet member or Chorus/Chapter leader. The VP of Chorus Director Development (VP-CDD) coordinates chorus director education opportunities for the district. This includes programs such as CDWI (Chorus Director Workshop Intensive), geared toward front line directors; Next LEVEL, geared toward directors, administrators and music leadership teams, and choruses at the chapter level; Become a Director, an introductory class geared toward developing novice and assistant directors, section leaders and other music leadership team members. The VP of Chorus Director Development promotes Director’s College at Harmony University, and assists attendees with scholarship applications as appropriate. He also promotes and assists directors in completing the Society’s Director Certification program. This program encourages continuing education of our directors. The VP-CDD may also be able to assist in director recruitment, pointing chapter leaders to appropriate director search guidelines, or helping match potential directors with chapters in need. Need to communicate with your peers at other chapters and other barbershoppers to get some ideas, share some of your news and insights, and/or your activities? We encourage EVERY Sunshine District Member to join our email group by going to: http://groups.yahoo.com/group/sunshinenet and register. We also have the availability of sending email to all district members or sub-groups such as Chapter Presidents, Secretaries, etc through Constant Contact. Please contact me for assistance. Every chapter is strongly encouraged to submit items, action photos and chapter happenings to the Sunburst, our quarterly on-line official publication of the Sunshine District Association of Chapters of the Barbershop Harmony Society. Just contact me or editor@sunshinedistrict.org. Roxanne Clapp is the editor. 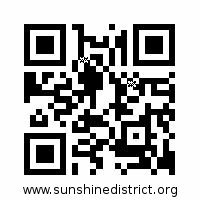 Have ideas for the District website http://www.sunshinedistrict.org? Contact Roger Smeds, webmaster. If you are interested in starting a chapter, please contact me. If you would like some ideas on how to make your chapter meetings perhaps more compelling to visitors as well as members, please contact me. All competitors are scored in three categories, Music, Performance, and Singing. Full information about each category can be found in the C&J Handbook. The District Representative for C&J is Paul Agnew. If you have a question concerning anything about the contest experience, he can probably find the answer for you. The Sunshine District is fortunate to have five certified judges including the Contest and Judging Chairman. Just starting their judging experience are two new Sunshine District members. Information about each Sunshine District Judge can be found here. If you ever thought about becoming a judge, contact Steve to express your interest. The next candidate cycle begins in January of 2017 and applications have to be submitted (with all letters of recommendation) before December 15, 2016. It is not too early to start making plans. The judging program is looking for well rounded individuals that are very active in Barbershop with experience in directing and/or coaching and singing. Also, if you have Project Management skills, a Contest Administrator may be just the thing for you. Check out the convention events on our district calendar for information about our conventions. You don’t even to have to ‘compete’ to take advantage of the opportunity to sing for the greatest bunch of people you will ever have for an audience! You can ‘compete’ for evaluation only (nothing goes on the score sheet) and get some great coaching or you don’t even have to walk on stage to get some great coaching and maybe even get a chance to sing at the afterglow!! So, think about it, this is YOUR convention. We want you here!! If you do intend to compete (for score), make sure you are very familiar with the Contest Rules. Here is a link to a contest overview and it contains a link to the entire C&J manual. Please make sure you are aware of the rules. Again, if you have questions, just ASK!! We will find the answer for you. Crossroads switching places with the Dapper Dans at DisneyWorld! 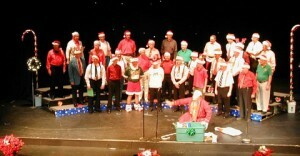 When the Barbershop Harmony Society talks about education, it’s not just about learning to sing. It’s about bringing music back into the family at home, at school, and on stage. In the Sunshine District, we have sponsored thousands of kids in music education festivals around the state and at our annual Harmony Explosion camp each June. We also teach many aspects of music and harmony to our membership such as music theory, voice placement, sight reading, and lots of other parts of a musical education they might not realize they are learning. Education means bringing music back into the home. Fifty or sixty years ago, music and singing in the home was as common as television is today. Families would gather around a piano and sing songs from sheet music they’d buy for ten cents. When is the last time your family gathered around for a sing-a-long? We’re here to bring that back by educating the public to the joy and pleasure of simple melodies and quality family time. There’s a Barbershop or Sweet Adeline Chapter in your area. Why don’t you check them out and let them demonstrate how much fun you can have in song? Visit our Chapter locator today. 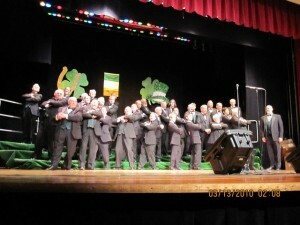 The Barbershop Harmony Society, of which the Sunshine District is a member publishes a Code of Ethics as well as related Policies and Procedures on their website. Please click a button below for more information.